Hypertension - catch, body, causes, Keyword, What Is Hypertension? Hypertension, or high blood pressure, is a condition in which the pressure of the blood in the arteries is above normal. Hypertension is the medical term for high blood pressure. Arteries are the blood vessels that carry the blood from the heart through the entire body. High blood pressure results either when the output of the blood pumped by the heart increases, or when there is an increased resistance to the flow of blood through the arteries, or both. In terms of numbers, a resting blood pressure of 140/90 or greater in an adult is usually considered to be high. Normal blood pressure levels are lower in children and rise with age. Everyone's blood pressure goes up in moments of excitement or stress, and that is considered to be normal. High blood pressure is considered a medical condition only when it continues over an extended period of time. This condition can then become a serious threat to health; the higher the pressure and the longer it is untreated, the greater the risk. People who have hypertension are more likely to suffer a stroke, heart attack, or failure of the kidneys or heart. For this reason, and because there usually are no symptoms, hypertension has been termed "the silent killer." Hypertension definitely is not the kind of condition one person can catch from another. Its causes are varied and complex: hereditary (genetic) factors, medical conditions, or medications can play roles. In most cases, no single cause for a person's hypertension can be found. Certain generalizations can be made about its prevalance * in the over-all population, however. It has been estimated that 60 million people in the United States have high blood pressure. This amounts to about 20 percent of the population, or one in every five persons. This prevalance is believed to be about the same in most industrialized Western countries; but the prevalance of high blood pressure is relatively low in developing (poor) or Third World countries. It is further estimated that about one-third to one-half of people with high blood pressure are unaware of their condition. Many people first find out when they go for a routine medical check-up. * prevalance of a disease or condition means how common it is in a population of people. Blood pressure is measured in units called millimeters of mercury (mm Hg). It is written as two numbers, one over the other. The number on top is the systolic pressure (when the heart contracts). The bottom number is the diastolic (when the heart relaxes between beats). The prevalance of hypertension is slightly higher in women than in men. Men and women of African descent are both more likely than others to develop the disorder. 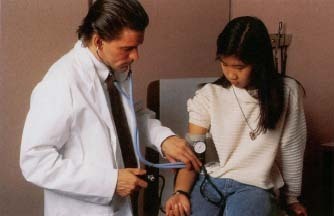 Hypertension usually begins after ages 20 to 30, and is uncommon in children and teenagers. Besides age, gender, and race, factors that have been linked to high blood pressure include obesity, smoking, a diet high in sodium (such as that found in table salt), excessive use of alcohol, and a family history of the disorder. How Does the Body Control Blood Pressure? As the heart forces blood into the arteries, the blood is kept under constant pressure. Many times a day, blood pressure rises briefly when the heart beats faster to supply blood to the parts of the body that need it. For example, a person's legs will need more blood when he or she is running a race. After the effort has ended, the blood pressure returns to its usual level. Over time, when a person is at rest, the body controls blood pressure in two basic ways. One way is by constricting, or narrowing, the arterioles (ar-TEE-re-olz), blood vessels that branch off larger arteries. The other way is by regulating the fluid volume of the blood. The kidneys have a key role in both of these functions. By secreting the hormone renin, they cause the arterioles to constrict, thereby raising the blood pressure. In addition, the kidneys control the fluid volume of the blood either by retaining sodium or by excreting it into the urine. Blood volume and blood pressure increase when sodium is retained in the body. Hypertension results when the body systems, which keep the width of the arterioles and the fluid volume of the blood in a normal relationship, become unbalanced. This disruption may occur because of disease or some other influence. Disease, such as disorders of the kidneys, certain tumors, or artery conditions, account for only about 10 percent of hypertension cases. In the great majority of patients, the precise cause remains unknown. In these instances, the disorder is referred to as "primary hypertension" or "essential hypertension." Certain factors are known to be influential in producing hyperten-sion. Factors that may contribute to the development of hypertension include a fatty diet and lack of exercise (which can lead to obesity) and too much salt in the diet. Hypertension also occasionally occurs in women who are taking birth control pills. Other factors include diabetes, smoking, and excessive alcohol consumption. Hypertension rarely causes symptoms by itself When it does, the blood pressure usually is extremely high. Symptoms may then include head-ache, nosebleeds, dizziness, confusion, and seizures. A florid (reddish) complexion is not, as is often believed, a sign of hypertension. People almost never can tell whether or not they have high blood pressure by how they feel. About one-third to one-half of the people who have high blood pressure do not even know it. Hypertension is called "the silent killer" because it can cause heart attack and stroke without warning symptoms. Many people with mild hypertension can be treated without the use of drugs. The guidelines for preventing high blood pressure are the same as the guidelines for leading a healthy life. Hypertension leads to or speeds up the process of atherosclerosis (ath-er-o-skle-RO-sis), or hardening of the arteries. In this process, cholesterol and other materials carried in the blood can build up in places along the artery walls damaged by years of high pressure. If a blockage should occur in the coronary arteries, which supply blood to the heart muscle, a heart attack ensues. If artery blockage occurs in the brain, the result is a stroke. Damage to arterioles can lead to brain hemorrhage (another kind of stroke), kidney failure, or blindness. Over a period of years, hypertension can bring about heart failure by overworking the heart. The course of hypertension if left untreated varies in different people. In most, the blood pressure tends to increase gradually over the years. A serious condition called pre-eclampsia (pree-ee-KLAMP-see-a) develops during the second half of pregnancy in about 7 percent of women. This disorder is characterized by a sudden rise in blood pressure, along with severe headaches, visual disturbances, and retention of fluids in the body. The condition is most common in first pregnancies and in women younger than 25 or older than 35. If left untreated, preeclampsia can lead to eclampsia, which is characterized by seizures and extremely high blood pressure that may be fatal to the mother or baby. Blood pressure is expressed as two numbers: the systolic (sis-TOL-ik) pressure and the diastolic (dy-a-STOL-ik) pressure. The higher number is the systolic pressure, which occurs during systole (SIS-to-lee), when the heart contracts. The lower number is the diastolic pressure, which occurs during diastole (dy-AS-to-lee), when the heart relaxes between beats. These numbers are read from a special instrument, called a sphyg-momanometer (sfig-mo-ma-NOM-e-ter). Written down, the two numbers are separated by a slash. Normal pressure taken at rest in adults is about 120/80, expressed as "120 over 80." Healthy young adults typically will have a pressure of about 110/75, however, and normal blood pressures are even lower in young children. As previously mentioned, a pressure of 140/90 or more in adults means hypertension. A doctor uses a sphygmomanometer to measure blood pressure. © 1995 Custom Medical Stock Photo. pressure varies over time. Moreover, some patients have what is called "white coat hypertension." This means that their blood pressure tends to go up when they are in a doctor's office, because being in the presence of a physician makes them feel anxious. To get an accurate reading, doctors will try to have their patients feel as relaxed as possible. If the patient has never had his or her blood pressure taken before, it is important for the doctor to explain that the process is painless. Diagnosing high blood pressure has to do with more than just numbers, however. The doctor will have to try to determine the cause. The patient may be asked about eating and exercise habits. If someone else in the family has a history of high blood pressure, that may be important. The doctor also may want to know about the patient's salt intake, consumption of alcohol, smoking habits, use of medications such as birth control pills, and use of street drugs. Urine and blood samples may be taken to check on kidney function and blood cholesterol levels. It is commonly observed that blood pressure tends to go up with age. Although true statistically, this does not mean that it is acceptable from a health standpoint. Blood pressure of more than 140/90 usually is considered a cause of concern at any age. For the small percentage of patients whose hypertension is caused by particular disorders of the kidneys or certain tumors or artery conditions, surgery may be the chosen treatment and provide a cure. For the great majority, however, the choice of treatment will likely be lifestyle changes or medication in addition to lifestyle changes. Many people who have mild hypertension (not much more than 140/90) can lower their blood pressure by adopting certain modifications in their lifestyle and diet, without the use of drugs. These changes may involve losing weight, getting more exercise, or modifying the diet in certain ways. Excess weight, especially obesity, can be a factor in raising blood pressure. In losing weight, usually it is best to take a gradual approach and to emphasize reduction of fat in the diet. Any weight loss program also should include regular exercise such as walking briskly or jogging (with a doctor's approval in adult patients). Many experts believe that it is almost impossible to lose weight permanently through diet alone. Most people with hypertension can help to lower their blood pressure by going on a low-sodium, or low-salt, diet. Studies have shown that people can get all the salt they need in the foods they eat without adding any. Good rules to follow are to add less salt at the table and in cooking, and to shop for foods low in sodium. Labels on cans or packages of processed food will indicate how much sodium is contained in each portion. In measuring the pressure, the cuff is inflated until it briefly stops the flow of blood in the arm (a painless process). The air pressure is then gradually released while a stethoscope (STETH-o-skope), a listening device, is placed on the artery of the arm just below the cuff. The pressure when the sound of the pulse is heard as the blood first begins to flow again is called the systolic pressure (the higher number). As more pressure is released, the sound of the pulse becomes muffled and disappears. The pressure atthat point is called the diastolic pressure (the lower number). The pressure is read on a gauge, which can be a glass column filled with mercury (the earliest type), a dial, or a digital readout. In some instruments, the blood pressure may be read directly, without the use of a stethoscope. The actual numbers in blood pressure readings represent millimeters of mercury (mm Hg), based upon the original glass column filled with mercury. The word "sphygmomanometer" comes from the Greek sphygmos, meaning pulse, plus manometer, a pressure gauge. Closeup view of sphygmomanometer dial used to measure blood pressure. Another factor that may be implicated in high blood pressure is stress. Although some stress is unavoidable in daily life, frequent unrelieved stress can be harmful. It is worthwhile to find ways, such as relaxation techniques, to lower stress levels. Physical exercise is an effective way to decrease stress and blood pressure in many people. Common-sense rules about avoiding harmful substances apply to people with normal as well as high blood pressure. It is inadvisable to smoke at any age or for adults to have more than one or two alcoholic drinks per day. The nicotine from cigarettes speeds up the heart and constricts blood vessels. Alcohol abuse has been associated with increased risk of developing hypertension, as well as many other health problems. Street drugs such as cocaine can have a direct adverse effect on the heart and increase blood pressure. If hypertension is moderate or severe, or if mild hypertension does not respond to diet, exercise, and other lifestyle changes, medicines may be prescribed. Doctors today have several different types to choose from, depending upon their patients' particular needs. Diuretic drugs are among the more commonly used. They act to increase the flow of urine and decrease the blood volume. Another group, called beta-blockers, alters the way the nervous system functions in the control of blood pressure. A third group of drugs, called vasodilators (va-zo-DY-layt-orz), act to relax the blood vessels, thereby decreasing the resistance to blood flow. Other types may be prescribed as well. Prescription drugs for hypertension may have various side effects, depending upon the drug and the person taking it. All antihypertensive drugs may cause dizziness and fainting, however, if the blood pressure is lowered too much. It is extremely important not to stop taking medication once begun without consulting the doctor. Doctors treating hypertension may wish to have their patients keep track of their blood pressure by taking readings at regular intervals. Devices for home use are available for this purpose. For teenagers and young adults, who are unlikely to have the condition early in life, hypertension may seem only a remote consideration. However, establishing a healthy lifestyle by keeping fit and trim through exercise and good eating habits, and not smoking, can help prevent health problems such as hypertension from developing later on in life. This is particularly important for people who have a family history of hypertension. Lastly, it is important for everyone to get their blood pressure checked regularly. Although doing so will not actually prevent hyperten-sion, it can get someone who has the condition into treatment earlier, thereby keeping it under control and lessening the risk of developing such serious health problems as heart attack and stroke.